(Bloomberg Opinion) -- Shares of Roku Inc. have taken a beating the last few days amid a string of analyst downgrades. But shareholders can take some comfort in knowing that this was more a function of an overheated stock price than a sudden change in the TV-streamer’s business trajectory. Roku lost $1.1 billion of market value in four days as investors heeded Citigroup Inc.’s advice and dumped the stock. Other analysts from Guggenheim Securities LLC, Macquarie Group Ltd. and Loop Capital Markets also lowered their ratings in recent days and weeks to “neutral” or “sell.” All cited the company’s valuation as a significant factor. That makes sense: Roku is still valued at an eye-popping 535 times estimated Ebitda, according to data compiled by Bloomberg. 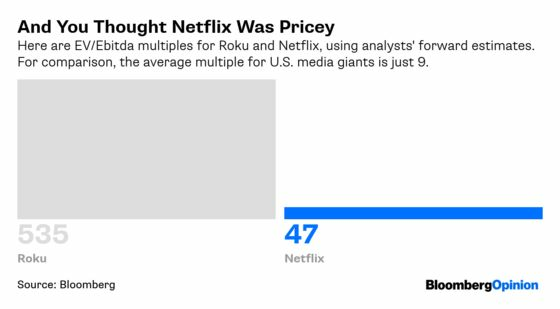 There are certainly some outlandish stock-price multiples in the technology and media industries, but Roku makes even Netflix Inc. – valued at 47 times Ebitda – look almost sensible. Roku has been a volatile stock ever since its market debut about 18 months ago. The price surged more than 40 percent in the first nine months of 2018, before ending the year down by the same magnitude. And so far in 2019, the shares are up 98 percent, even after this latest sell-off. That’s quite a ride. 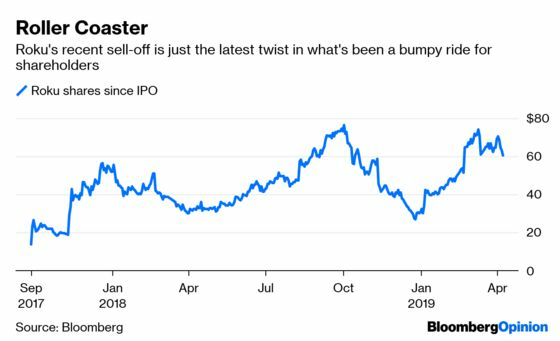 Some company insiders, including Roku’s CEO (founder Anthony Wood) and CFO, sold shares recently, taking advantage of what is objectively a rich price – no matter how bullish you are. Still, some have interpreted that as a negative sign. It’s true that competition will heat up for Roku, as giants like Apple Inc. and Amazon.com Inc. make a bigger push into video streaming. But the company has carved out a section of the market that’s fairly defendable, and it may be well served by targeting budget-conscious consumers who are overwhelmed by the insurgence of online-video subscriptions. To understand how, it’s first important to grasp what Roku is, because that’s evolved over time. Roku started out making hardware that plugs into TV sets to support streaming apps, and it still does that. But it’s now also a tech platform that’s already preloaded on certain TVs. In fact, 10 of the top 20 selling TVs on Amazon are Roku-connected TVs (eight, by comparison, are Amazon Fire TVs). Rounding out its business, Roku sells ads for its free streaming product called The Roku Channel (which offers a variety of network and other TV shows and entertainment), thus creating its own little entertainment ecosystem. The company says that roughly half its customers are cord-cutters, folks who no longer pay for traditional cable packages. Meanwhile, Amazon’s Prime membership isn’t cheap at $119 a year for former cable customers looking to cut back (though Prime does include Amazon shopping benefits and there is a stand-alone Prime Video membership for $8.99 a month). Such costs also add up quickly for those who want to watch Netflix and HBO, for example. 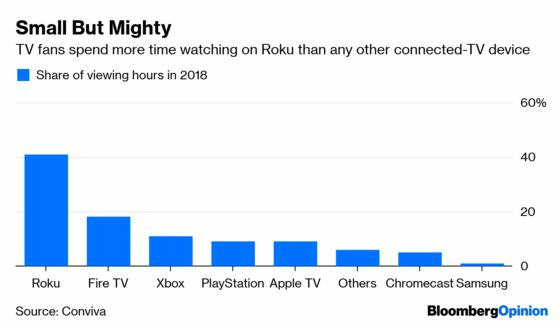 Furthermore, while Amazon’s Fire TV product is gaining share among connected-TV devices, Roku takes a significantly larger share of viewing hours, according to audience-measurement firm Conviva. That’s a major selling point for advertisers, and it may be explained by perhaps Roku being the sole viewing device for some users, whereas others who can afford Amazon Prime may have multiple devices and subscriptions. The names Amazon and Apple are inherently threatening to smaller players, but investors may be partly misreading Roku’s competition. The company is hoping to generate an increasing portion of its revenue from ads, which puts it up against the likes of Pluto TV, a free, ad-supported, live-TV streaming product that Viacom Inc. recently acquired. Like Roku, other companies have figured out that “free” can be a rather compelling offering to consumers turned off by the growing complexity of the marketplace for TV subscriptions and the cost that it brings. If anything, Roku could do a better job of promoting its free service as an alternative to the niche paid apps being launched by TV-network owners. Even for those who end up subscribing to services like Walt Disney Co.’s Disney+, which is being unveiled at the company’s investor day Thursday, The Roku Channel offers supplemental live TV – such as reality shows that wouldn’t necessarily fall into the bucket of content worth paying for separately, but will be watched if it’s free. Roku’s stock price may have been due for a reset, but the business is still impressively holding its own. Apple hasn't disclosed the price of its soon-to-come Apple TV+ service.